Maybe the streets were more crowded and congested than normal. There’s a big event in town and everyone who was anyone was expected to be there. A teen father and his teen bride have made the nearly 80 mile journey despite the fact that she is desperately “with child.” This baby’s going to come and he’s going to come soon! They seek shelter in an inn or a guesthouse and with so many people in town, there’s just not much space available. Travelocity isn’t around to help them find alternative lodging. So, they end up with the next available lodging — a stable with the animals. It could have been a cave carved into a wall. It could have been the downstairs of the home. It could have been a free-standing structure out back. But it was their space. Notice who isn’t here. No evil innkeepers barring their entrance into his establishment. No choirs of angels singing in the background. No magic lights from heaven or erie glowing lights. It’s just Mary and Joseph in a quiet space. And then the baby arrives. 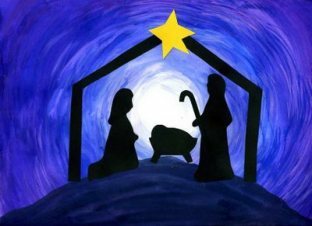 In the quiet still space of a stable, the savior of the world arrives. There’s no party for the future king. There’s no royal decree. When God chooses to deliver Emmanuel — God with Us — He does so in the most unlikely of places to the most unlikely of people in the most unlikely of settings. And if God can change the world from a stable in the small town of Bethlehem, from a savior born to a humble and poor family, then I wonder what he can do with us? So this is Christmas. Are you ready? Joseph’s Story: What follows the “To”?